Complete with tools: 10' vacuum hose, "S" wand with durable head, dusting brush, squeegee tool, scallop bristle floor brush, and crevice tool. After a full century of conceptualizing and building the products that have kept your home clean from ceiling to floor, Hoover® has designed the complete floor care solution to fulfill your commercial needs. 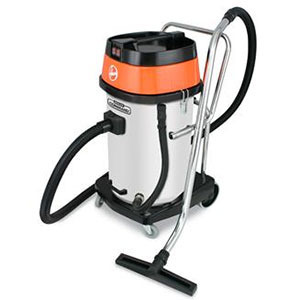 The Ground Command™ array of products includes a full selection of wet/dry vacuums, floor machines, backpack vacuums, extractors, and air movers—all designed with the legendary Hoover® endurance and quality you've come to trust. With a five year or lifetime warranty on almost the whole product line, rest assured; your investment will continue to save you time and money for years to come. Ground Command™ by Hoover®. Durable. Powerful. Guaranteed. Cloth vacuum filter controls dust and protects the motors from debris. Easy to remove and wash.
Includes a 10' long, 1.5" diameter vacuum hose that locks securely to the tank port and a 4 piece tool kit to increase cleaning versatility. Tool kit includes dust brush, squeegee tool, scalloped bristle floor brush and crevice tool. Standards: UL Listed, ETL	Tank Size: 20 gal. Warranty: 1 yr.	Width: 17"
Wet Capacity: 15 gal. Hose Dia. : 1-1/2"
Watts: 1000	Dry Capacity: 20 gal. Item: Wet/Dry Vacuum	Hose Length: 10 ft.